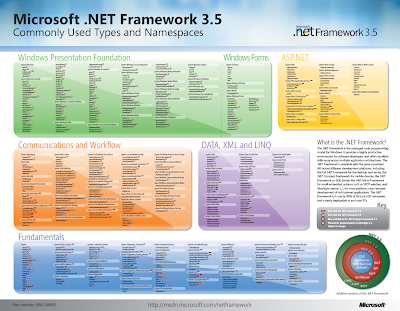 Microsoft released poster of .NET Framework 3.5 Commonly Used Types and Namespaces. The poster gives an overall idea on all the important namespaces and classes of new .NET Framework 3.5. If you love .NET Framework, you can keep this images as your desktop background or get a big printout to fix it near your desk. The poster is also available as a PDF file which is more clear. You can download it from here.